Joy The Sock Puppet is the official Spokes-Puppet for The Joy Of Sox - providing socks for the homeless. This is really exciting news!! 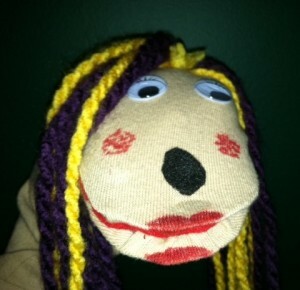 Joy the Sock Puppet™, is now the official Spokes-Puppet for The Joy of Sox. She is excited about her role, but still a little shy because she does not have a voice yet. But she is fearless. She is already working on a series of videos for YouTube talking about the plight of the homeless and the health problems of not having proper socks. And she is thinking big. She whispered to me this morning that she really wants to do Good Morning America. She also was mad at me for taking her picture before she did her hair!